Located in Near North Side, Omni Chicago Suites - Magnificent Mile is next to popular attractions like Michigan Avenue and Northwestern Memorial Hospital. This 347-room, 4.5-star hotel has conveniences like an indoor pool, a 24-hour health club, and a spa tub. This hotel is home to a restaurant and a bar/lounge. Order from 24-hour room service to satisfy your hunger without leaving your room. For your convenience, a buffet breakfast is served for a fee each morning from 7 AM to 11 AM. Guests can expect to find WiFi and 42-inch an LED TV with cable channels and a DVD player. Pillowtop beds sport premium bedding and the bathroom offers a hair dryer and designer toiletries. Other standard amenities include a sofa bed, a sitting area, and a coffee maker. Guests of Omni Chicago Suites - Magnificent Mile have access to an indoor pool, a 24-hour health club, and a spa tub. Valet parking is offered for USD 72 per night. The front desk has multilingual staff on hand 24/7 to help with tours or tickets, securing valuables, and luggage storage. Other amenities at this luxury hotel include conference space, coffee/tea in a common area, and express check-in. 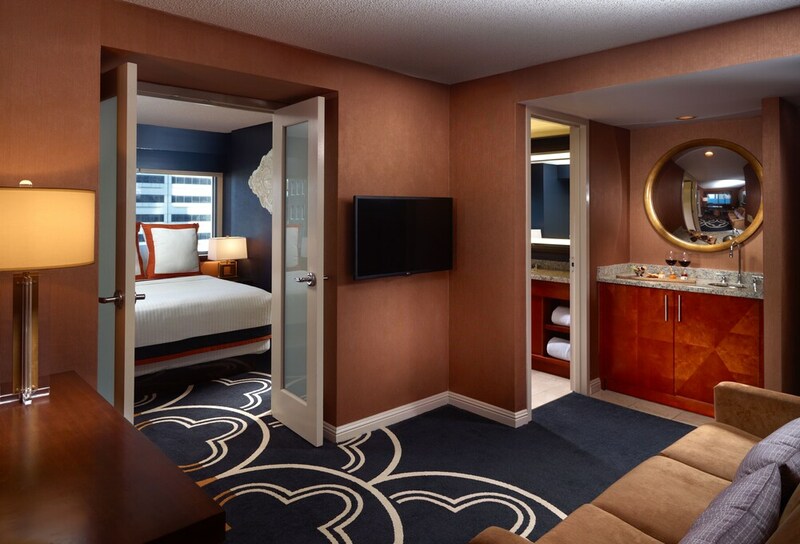 Omni Chicago Suites - Magnificent Mile features newly renovated guestrooms, lobby area, and restaurant. The hotel also features an indoor pool and a health club. A bar/lounge is on site where guests can unwind with a drink. This luxury hotel offers multilingual staff, concierge services, and coffee/tea in the lobby. Onsite parking is available (surcharges). Omni Chicago Suites - Magnificent Mile is a smoke-free property. Omni Chicago Suites - Magnificent Mile offers 347 air-conditioned accommodations with DVD players and laptop-compatible safes. Accommodations have separate sitting areas and are furnished with double sofa beds. Pillowtop beds feature premium bedding. 42-inch LED televisions come with premium cable channels and pay movies. Bathrooms include shower/tub combinations, bathrobes, designer toiletries, and complimentary toiletries. In-room wireless Internet access is available for a surcharge. Business-friendly amenities include desks and phones; free local calls are provided (restrictions may apply). Additionally, rooms include coffee/tea makers and hair dryers. Microwaves, refrigerators, and in-room massages can be requested. Housekeeping is provided daily. 676 Restaurant and Bar - Onsite restaurant. Guests can enjoy drinks at the bar. A children's menu is available. Start your morning with a buffet breakfast, available each day from 7 AM to 11 AM for a surcharge. You can order a meal from 24-hour room service.